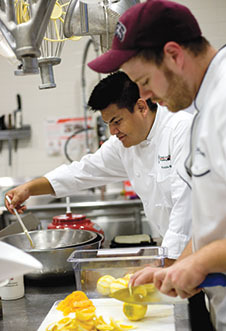 Bates Dining Services cook John Caron (foreground) and chef Freddie Jonathan Bitsoie, an authority on Native American cuisines, make an orange sauce for cheesecake. Pinenut-crusted salmon and pumpkin bread pudding were also on the menu as Bitsoie visited in August to work with kitchen staff from Bates and Bowdoin. A member of the Navajo Nation, Bitsoie parlayed a college anthropology major into food-service training. Now he combines history, anthropological research, and standard culinary practice in his work — the goal being to honor ancient foodways while adapting them to the modern kitchen. It’s as much about communal stories as ingredients or techniques, he says. “Through those stories we’re taught how to respect food, how to respect culture, and preserve our way of life — meaning anyone from any background.” Bitsoie directs the French and Native American Program at the Classic Cooking Academy in Scottsdale, Ariz. Photograph by Phyllis Graber Jensen.